We checked the weather report for last minute conditions. Then were off to the Mount Townsend Trailhead in the Olympic National Forest. The report stated to plan for winter like weather. A recent cold front dropped a few inches in the Olympics overnight down to around 3,000'. Decided to go for it, even if spring melt had me questioning avalanche conditions. Would turn around if I felt it wasn't worth risking. Ended up not feel in any danger that day, even tho my mind was always on slope risk. More info? 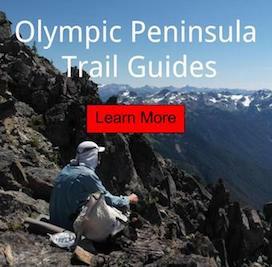 Learn about the Olympic National Forest lands. Navigation was pretty straight forward. The summer trail runs the ridge that joins Mount Townsend . I did stray away from the path a few times, to avoid steep icy areas. Lots of hiding spring snow bridges and tree wells, made sure you stayed on your toes (pun). The views on top were some of the best that the Olympics had to offer: since the air quality was so good. One could see the Cascade Range in British Colombia, Mount Baker, Mount Rainier and south to Mount St Helens. Then from Striped Peak which is west of Port Angeles, downtown Seattle and to Southern Puget Sound. Turning around into the mountains, one can see most peaks in the northeast corner of the Olympics. Hawk Peak, Mount Buckhorn, Grey Wolf, Baldy and Tyler Peak. Plus many more that lie behind them. Ended up trail running with lots of sliding around on the way down. Rhododendron's want to bloom, if it would ever stop snowing. Lots of this; to make it around spring cornice's. Views of the false summit of our objective. Ascending with Sequim, Wa in the background. Mount Townsend (left), Hawk Peak and Mount Buckhorn (right). Silver Lake also sits where he is looking. Facing the Buckhorn Wilderness w/ Grey Wolf Ridge (right). Special thanks to Torry for sharing the adventure. This was another fun adventure into the Olympic Mountains, to climb Mount Townsend. You can also check out our climb of Mount Angeles in spring conditions.